Posted on Nov, 29, Thu at 1:23 pm. We would like to welcome The Purrfect Mattress in Port Charlotte, FL to the Fill Station® License Network. Posted on Nov, 29, Thu at 1:22 pm. We would like to welcome The Towel and Home Shoppe in Brooklyn, NY to the Fill Station® License Network. Posted on Sep, 16, Sun at 10:34 am. We would like to welcome Mattress, Furniture, and More in Mesa, AZ to the Fill Station® License Network. Welcome Sooner Mattress in Norman, OK! Posted on Jun, 04, Mon at 1:02 pm. We would like to welcome Sooner Mattress in Norman, OK to the Fill Station® License Network. Welcome Murmaid Mattress in Chattanooga, TN! Posted on May, 23, Wed at 2:59 pm. The Fill Station® Group would like to welcome Roger Pickett and the Murmaid Mattress team to the Fill Station® Licensee Network. Posted on Mar, 23, Fri at 11:48 am. Posted on Mar, 19, Mon at 5:39 pm. John, owner, at John’s Bedroom Barn shares his success story with the Fill Station® Pillow Kiosk that helped him sell a $7,500 mattress sale. The Fill Station Group is determined to help retailers create retailtainment to attract customers into their showrooms daily. Posted on Nov, 16, Thu at 1:17 pm. The Fill Station network is growing! We would like to welcome Sleep Haven Bedding with two Fill Station locations located in Modesto, CA and Redwood City, CA. Additionally, we would like to welcome Today’s Bed in Woodbury, MN to the Fill Station licensee network. Posted on Oct, 11, Wed at 10:17 pm. Posted on Sep, 02, Sat at 9:35 pm. The Fill Station Group is pleased to announce their latest partnership with Relax The Back in Tulsa, OK.
Posted on Jun, 29, Thu at 12:18 pm. Posted on Jun, 20, Tue at 1:42 pm. The Fill Station® group would like to welcome Sleepy ZZZ’s to our network of licensee’s. Sleepy ZZZ’s is located in Memphis, TN. Posted on Apr, 24, Mon at 3:48 pm. The Fill Station® Group would like to welcome John Arnold of Mattress Factory located in Grand Rapids, ND. Posted on Apr, 24, Mon at 3:45 pm. Welcome America’s Mattress & SlumberKid’s Plus to the Fill Station® Licensee Network! Posted on Mar, 21, Tue at 10:27 am. The Fill Station® group would like to welcome two new licensees to the Fill Station® network; Mattress Studio in Lawton, OK and The Mattress King in Omaha, NE. Posted on Mar, 13, Mon at 11:18 am. The Fill Station® Group would like to welcome Elephant’s Attic to the Fill Station® network of licensees. Elephant’s Attic is located in Vandalia, IL. Posted on Feb, 08, Wed at 9:36 am. The Fill Station® Group would like to welcome Strouds Home Furnishings to the Fill Station® Network of Licensees. Strouds Home Furnishings is located in Russellville, Arkansas. Posted on Feb, 01, Wed at 3:59 pm. We would like to welcome Lou Rippner’s Compass Furniture in Jefferson, LA near New Orleans to the Fill Station® Pillow Kiosk network. Thanks for becoming our first Furniture Store in the program! Posted on Feb, 01, Wed at 3:45 pm. Posted on Jan, 16, Mon at 10:15 am. The Fill Station Group would like to welcome Jeff Saunders of America’s Mattress in Tucson, AZ to our network of licensees. Posted on Jan, 12, Thu at 9:36 am. The Fill Station® Group would like to welcome its newest licensee, Robert Mitzell from Sleep On Mattress. Sleep On Mattress is located in Bismark, North Dakota. Posted on Dec, 09, Fri at 1:02 pm. Posted on Dec, 07, Wed at 5:26 pm. The Fill Station Group would like to welcome Mattress Makers to the Fill Station network of licensees. Mattress Makers is located in San Diego, CA. Posted on Nov, 09, Wed at 10:21 am. Fill Station® Group is excited to announce that a new retailer, Mattress Bliss, has joined the Fill Station® network of licensees. We are excited to work with Lloyd Freeman and the Mattress Bliss team. Just in Time for the Holidays…Fill Station® Friends are Available! Posted on Nov, 08, Tue at 2:55 pm. Aromatherapy Pillow Mist Collection – Now Available! Posted on Nov, 08, Tue at 2:46 pm. Posted on Nov, 08, Tue at 2:44 pm. Posted on Sep, 01, Thu at 11:09 am. Posted on Aug, 26, Fri at 3:26 pm. Posted on Jul, 21, Thu at 9:43 pm. Posted on Jul, 20, Wed at 7:46 am. Fill Station Group now offers leasing! Posted on May, 31, Tue at 7:53 am. Trent Bedding does their Big Reveal Today! Posted on May, 20, Fri at 11:36 am. Trent Ranburger, the owner of Trent Bedding, does his Big Reveal of the Fill Station Pillow Kiosk Live through Social Media. The Fill Station Group wants to thank Trent Bedding for becoming a licensee, and we are excited about our partnership. 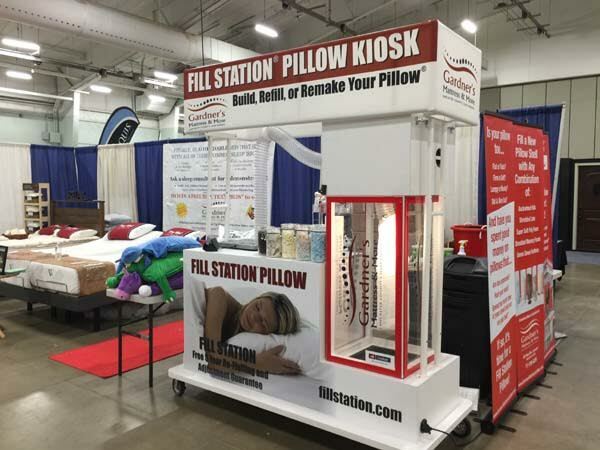 We are now licensing the Fill Station Pillow Kiosk Program to mattress and furniture stores. Posted on Feb, 09, Tue at 2:13 pm. Posted on Jan, 04, Mon at 10:47 am. Posted on Sep, 15, Tue at 12:36 pm. Posted on Sep, 03, Thu at 9:01 am. Posted on Aug, 27, Thu at 7:51 am. Posted on Aug, 05, Wed at 9:42 am. Posted on Jul, 21, Tue at 1:08 pm. Posted on Jun, 08, Mon at 12:38 pm. The Fill Station® Chiropractic & Physical Therapy Partner Program starts rolling out today. Thanks to Dr. Jeremy Johnson for being our first partner. Today we have partnered with Dr. Paul Patterson to build custom neck pillows for his patients in our showroom. Looking forward to more partners in the coming weeks. Posted on May, 28, Thu at 7:26 pm. Posted on Apr, 23, Thu at 6:26 pm.